Suit Direct is the first port of call for men in need of formal or even casual wear, with its catalogue brimming with stylish, quality and well-fitting goods. With a comprehensive range of suits, separates, accessories and more - here you can completely kit yourself out for a wedding, smart day out, family event or for a daily meeting at the office. Whatever your suit needs may be, now there's no need to sweat over what to wear with Suit Direct. Here, you will find fashion to suit all styles, sizes and budgets too. From knitwear to checked blazers, this is where you will find tailored, regular and slim fits as well as goods for the Big and Tall men out there. Now your style has no limits when you can shop popular designer brands like Ben Sherman and Jeff Banks, for all of the apparel, shoes and accessories that you need to complete those outfits. Shop by colour, material, style and more to find a huge array of goods to help you stand out on every occasion. The Suit Direct brand is keen to help all men become more fashionable; stick with them and even take on some tips from the Style Guide to give you more confidence in finding your image and updating your wardrobe today. How do I use my Suit Direct discount code? Select the offer you would like to use by clicking on the ‘View Deal’ or ‘Get Code’ button. Deals without a discount code will be applied automatically so you can continue to checkout securely. Register with Suit Direct and stay in the know for the latest suit fashions and maybe even a discount or two! Is there a Suit Direct store near me? There are more than 20 Suit Direct stores in the UK. Use the store locator to find the store closest to you. Is there a Suit Direct outlet? 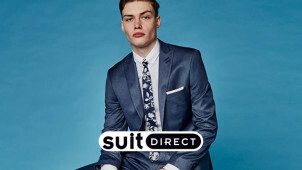 Visit the Clearance page of Suit Direct for hot bargains in all departments, from designer suits to items from the Big & Tall range. Does Suit Direct offer free delivery? Suit Direct offers free delivery as standard on all orders over £70. For orders less than £70, the delivery charge is £4.95. Call: 0333 999 08 89 or use the contact form. Opening Hours: 8.30am – 5pm Monday to Thursday and 8.30am – 4.30pm Friday. For work, a job interview, wedding, race day or other event - every man should have a decent suit in his wardrobe! Suit Direct is the number 1 online supplier of affordable suits for everyday or formal wear. Use a Suit Direct discount code and you can save money on smart apparel from suave brands like Ben Sherman, Limehaus, Pierre Cardin and Alexandre of England. With separates available too, shop jackets, shirts, ties, and accessories galore - you’ll always look sharp with Suit Direct. If you don’t know where to start when it comes to picking up a suit, take a look at the Style Guide on the Suit Direct website for advice on how to pick the perfect suit, shirt and more. This will help you steer clear of any fashion faux pas, and is the perfect destination for if you are in need of a little styling inspiration. At Suit Direct you will always get that Gold Standard service, so for every time that you need to be suited and booted for a wedding, christening, or family event - trust the experts at Suit Direct. If you’re above the average height or well built and struggle to find suits that fit - good news - as Suit Direct has a whole section devoted to Big & Tall men, which is perfect for guys like you. Save with a Suit Direct voucher code and you can buy stylish Pierre Cardin suits, Scott & Taylor dinner suits, Gibson London casual shirts and much more, all of which are designed to fit a larger frame perfectly. Suit Direct also caters for slim and skinny men, so no matter what size you are there will be a garment to fit you on the Suit Direct website.